"... he spoke to fish in the creek. He tried to tell us that the animals could speak. Who knows ... perhaps they do. How do you know they don't just because they've never spoken to you ? " We are dedicated to providing quality care through skill and compassion for both our clients and their companion animals. We believe that your pet's comfort is tantamount to its well-being. The cure should never seem worse than the ailment. We look forward to serving your needs and invite your suggestions to help us build the best mobile veterinary service possible. Companion animals play a crucial role in all of our lives. They touch our hearts in a unique way ... unlike anything else we encounter in life. As a veterinary team, we feel that it is our responsibility to not only provide high quality, state-of-the-art care to our patients, but to educate our clients so they can work with us to do the same. We will provide the highest quality veterinary health care for all of our patients with the same compassion we show our own companions. 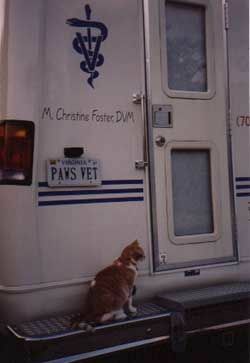 —To offer a progressive mobile veterinary service to meet the client's changing needs. —To provide client education in order to enhance the quality of life of all companion animals. —To encourage open communication and maintain relationships with professionalism and a personal touch.